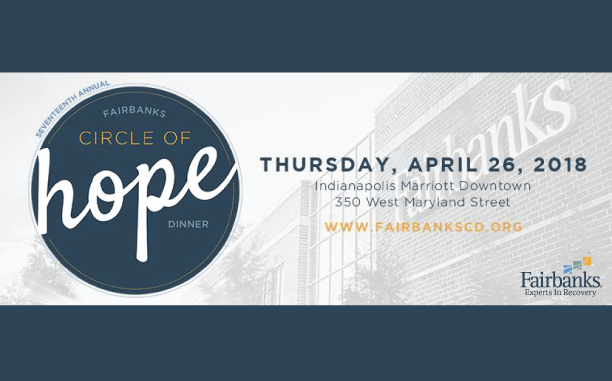 Silverback is proud to sponsor Fairbanks annual Circle of Hope Dinner, which helps support Fairbanks patients recovering from drug and alcohol addiction. The event will be presented by Jim Irsay and the Indianapolis Colts on April 26, 2018 at the Indianapolis Marriott Downtown. The annual dinner aims to inspire hope and raise awareness about addiction within the Indy community by celebrating and featuring the voices of those in recovery. As a 2018 Ally Sponsor, Silverback is proud to support Fairbanks’ work within the community through Circle of Hope, as well as Taste of Hope, which recently raised $68,000 for Hope Academy students to assist their journeys of recovery. Circle of Hope’s keynote speaker will be former NFL quarterback Ryan Leaf, who currently works as a program ambassador for Transcend Recovery Community. The Richard M. Fairbanks Circle of Hope Award, which is presented to those making outstanding contributions to the field of addiction, will go to Leah Mannweiler of Krief Devault, LLP and chair of the Hope Academy Board of Directors. The Silverback team looks forward to taking part in an important cause within the Indianapolis community. Fairbanks is a nonprofit alcohol and drug treatment center. We are one of the oldest independent alcohol and drug treatment centers in America. We started treating alcoholic men in 1945 in a house on Alabama street in Indianapolis, Indiana. We now serve men, women, adolescents and their families who struggle with addiction from the Midwest and around the country. Hope Academy is a tuition-free, Indiana public charter high school for students in recovery from drug and alcohol addiction. As the only recovery high school in Indiana – and just one of 36 nationwide – Hope Academy provides a supportive community for students to maintain their sobriety and receive a Core 40 diploma. Hope Academy is one of only three recovery high schools in the United States accredited by the Association of Recovery High Schools. Find out more information about Circle of Hope Dinner.